dainty brush work as that to which I have referred. 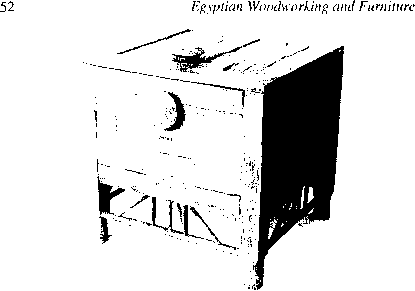 The introduction of the "Martin" preparations and methods of application made it practicable to enrich furniture with the choicest and most delicate paintings without fear of their coming to harm ; and so highly were the innovations made by the family in this direction esteemed by those in authority that, in the year 1730, Guillaume and Simon-Etienne were accorded the sole right, for twenty years, of making " toutes sortes d'ouvrage en relief de la Chine et du japon," and the brevet was further confirmed and extended in 1744. The Martins, throughout their career, cultivated the decoration of coaches, sedan-chairs, and similar vehicles, as well as that of furniture, wall-panelling, and the like. 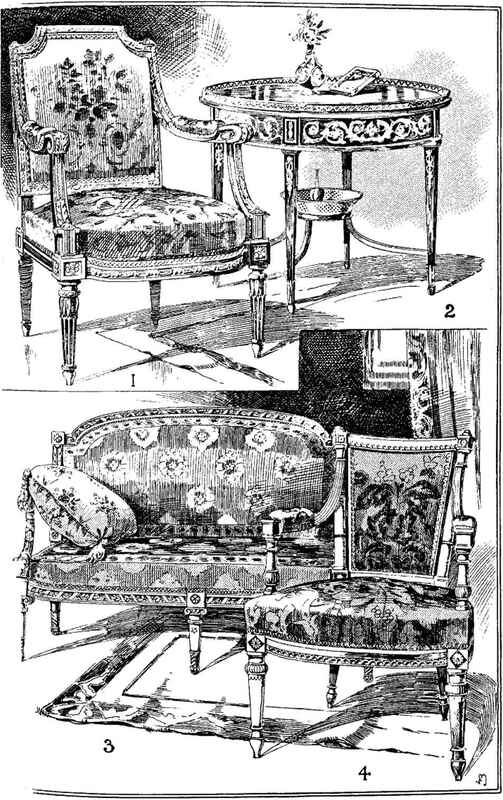 Indeed, "Vernis-Martin" may be regarded as ranking among the most important features of the furniture of this period. With the foregoing comments we must leave the " Louis Quinze "; but, before doing so, the reader may well ponder again over the examples presented here, institute a mental comparison between them and the forms based upon them which appeared later in this country, and then debate in his mind the question whether the spirit of luxurious sensuality has been so materially expressed, through the medium of wood, metal, and textile fabrics, in any other age or country, before or since, as it was in France during the days of the Pompadours and Du Barrys. We may attempt to copy the " Louis-Quinze," as we have attempted in the past; we may imbibe some of its qualities, as we have done and may still succeed in doing: but to expect the British nature to interpret the style as it was in the 'land of its birth in its best and palmiest days, with all its rare, subtle, and sinuous grace, is to look for a moral impossibility. It is not the skill of the British artist and craftsman that is wanting in this regard, but his very nature and temperament, for the possession of which he cannot be blamed. While all those influences were at work in France which led to the ultimate debasement of the "Louis-Quinze," others also were active in a totally opposite direction. By the death of his father in 1765, the future king became heir to the throne, and, in 1770, the marriage was arranged and consummated between him and the beautiful Marie-Antoinette, Archduchess of Austria, who was at that time only fifteen years of age. Thus it happened that while, on the one hand, the wildest extravagances were being encouraged by the ruling monarch, his favourite, and her satellites, the destined ruler, disinclined by nature to find relaxation in the licentious debaucheries of the court, was exploring the sciences and mending his locks, happy in the congenial companionship of his young but rarely cultured partner. The presence of this dauphiness as a prominent figure in such a scene presents a picture of refinement set amidst ribaldry, culture hemmed in by chicanery, love surrounded by lust; but she held aloof from the less desirable associations and companionships, and, fortunately for her, found a kindred spirit in that of her " lord and master."